Dr. Carla Day and her family. As Dr. Day learned more about chiropractic she realized how much more it could offer than just symptom relief. She knew it was the right choice for her and fit perfectly with her active lifestyle. Dr. Day received a Bachelor of Science (Biology) from Memorial University of Newfoundland in 1997. She continued her education at Canadian Memorial Chiropractic College in Toronto, where she received her Doctor of Chiropractic in 2001. She finished her certification in Acupuncture with The Acupuncture Foundation of Canada in 2005. She has continued with professional development studies in pediatrics, pregnancy, nutrition and custom foot orthotics. 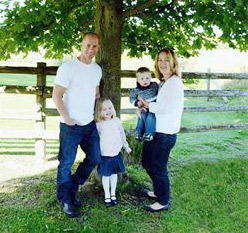 Dr. Carla Day lives with her husband and two children just outside Schomberg. She enjoys many of the outdoor activities provided by this region, especially running and cycling. 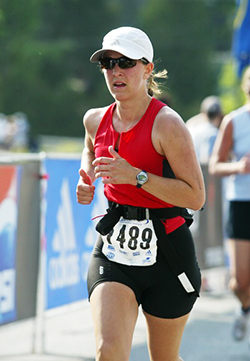 She has completed numerous triathlons, duathlons, half marathons and her first full marathon in 2010. She enjoys being outside and active with her children hiking, swimming, kayaking, snowshoeing, skiing and skating. Dr. Day running her first marathon! Chiropractic is part of her family’s life style. Dr. Day, her husband and children are all adjusted once every one or two weeks. She also receives regular massage therapy. Both Dr. Day and her husband live a very active life style. They cycle and run regularly. Dr. Day has started a running group at the clinic, which includes a learn to run program and an intermediate running group. Clinics are offered in the spring and fall.